Leola: Just look at my hair! Dotty: Oh, I'll fix it. Leola: You can't fix it! It's purple! Dr. Sam Beckett: Looks kinda punk. It's gonna be very big in the '80s. Dr. Sam Beckett's adventures continue in Quantum Leap: The Complete Third Season and they are just as potent as ever. One of the most impressive feats of the Quantum Leap series is how it never delivered a stale episode; undoubtedly due in part to its unique premise. As Sam (Scott Bakula) leaps through time correcting history's mistakes with the help of Al (Dean Stockwell), an endless supply of potential storylines allow the show's writers to explore this nation's history while delivering poignant human dilemmas. The season begins with Sam leaping into himself as a 16-year-old boy in The Leap Home, Part I. It's Thanksgiving 1969, with the young Sam preparing for the big basketball game and the family eagerly awaiting a visit from his older brother Tom (David Newsom), prior to his shipping off to Vietnam. According to Ziggy, the supercomputer monitoring Sam's leap, he is only there to make sure the high school team wins the basketball game this time around. However, Sam can't help but try to save his dad (also played by Bakula) from an upcoming heart attack or his sister, Katie (Olivia Burnette), from a future, disastrous marriage. It seems that nothing he does will be able to change the upcoming tragedies for his family, including Tom's death in Vietnam. However, the mystery behind his extraordinary journey gives him another chance to save Tom in The Leap Home, Part II, which finds Sam as one of the soldier's in his brother's platoon on the eve of Tom's death. Ziggy maintains that Sam is only supposed to ensure the rescue of two POWs, but will this prevent Sam from saving his brother? I've always found those two episodes to be among the best of the entire series, especially Part II. The writers makes a wise choice of completely ignoring the potential problems this would cause in Sam's own lifetime—after all, he changes his own past, which could cause him to never enter into the time travel machine in the first place. Instead, we get two solid storylines that deliver plenty of human drama, especially when Sam tries desperately to prevent Tom from going to Vietnam, and some well-staged action sequences. There's even a great twist with Al at the end of Part II that brings a whole new dimension to his character. After the season's beginning, the show returns to its more familiarized territory. Sam bounces around the 20th century's timeline, rectifying major events and minor ones as well. As a priest in Leap of Faith, Sam helps another man of the cloth, Father Mac (Sandy McPeak), deal with the emotional turmoil of witnessing a young parishioner's death. The two fight with the murderer so violently you just know this takes place in a pre-Vatican II era. Another entertaining episode features Sam as Billy Jean in 8 1/2 Months. None of his medical training has prepared Dr. Beckett for the cravings and pains of a pregnant teenage girl, who needs to find reconciliation with her disapproving father (James Whitmore Jr.). However, will Sam manage to bridge the father-daughter gap in time, or will he become the world's first man to give birth? There are many other entertaining outings for Sam, especially Glitter Rock, where he becomes Tonic, the lead singer of the rock group King Thunder. Fighting off groupies is only the beginning of his struggle, as he soon learns that Tonic will be killed by either a stranger (Christian Hoff), the jealous backup singer Flash (Jonathan Gries), or the group's crooked manager Dwayne (Peter Noone of Herman's Hermits fame). But some of Sam's travels are grittier than the others, such as in Black on White on Fire. During the infamous Watts Riots of 1965, Sam leaps into the body of a black man, Ray, dating a white police captain's daughter, Susan (Corie Henninger). Sam needs to prevent them from splitting up, fighting off both Susan's father and Ray's militant brother, Lonnie (Gregory Millar), all while keeping them both from the chaos of L.A.'s devastating uprising. The editing between documentary footage of the riots and dramatized events is, for the most part, convincing and the violence rightly heavy (especially considering it aired in 1990). 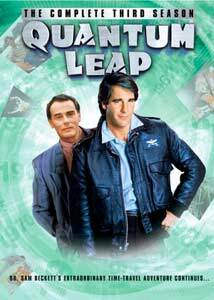 The balance between intense dramas and lightweight entertainment is what makes Quantum Leap such a good show. Every story is a genuinely new experience, a subject or theme the program hasn't delved into before. At times one might wonder how fortunate Sam is that nobody hauls him off to the loony bin for talking to Al, whom nobody else can see (although the season's finale, Shock Theater, actually has Sam Beckett leap into the body of Sam Bederman, a mental patient), but the suspension of disbelief is largely maintained due to the solid handling of the material by the show's varying directors—making this a first-rate television no matter what decade you're in. Furthermore, the acting is topnotch. The guest stars for each episode all fit in nicely, but it's the work of Scott Bakula and Dean Stockwell that make these situations seem plausible. Especially noteworthy is Bakula's physical performance as Billy Jean, superbly conveying the nuances and posture of a pregnant woman. Stockwell also gives fine comedic relief, always making wisecracks about Sam's behavior and the shapely women he finds himself observing. The third season of Quantum Leap builds on the first two seasons and sets the following seasons up with 22 episodes of solid entertainment and some interesting insights into history. Perhaps logic would never admit for the existence of such an extraordinary adventure, but when the viewing is this good, who cares? Image Transfer Review: The image is a step up from the syndicated broadcasts on the Sci-Fi channel, though it does at times suffer from being grainy. Otherwise, this is a solid treatment of the original broadcasts, with nice detail and contrast. Audio Transfer Review: The Dolby Stereo 2.0 sound sounds pretty nice, especially in ProLogic. Adding the surround speakers into the mix, the music and some sound effects help give a greater presence to the soundtrack. There isn't much in the way of directionality or separation that I noticed, so it isn't the liveliest of mixes. Nonetheless, audio is well balanced and the mix is clean. Extras Review: Excluding the promotional trailers for the first three seasons of Northern Exposure and the second season of Magnum P.I. , The A-Team, and Knight Rider on DVD, there is little in the way of supplemental features. The additional trailers for White Noise and the upcoming special edition DVD of Casino will have to suffice as extras for this set. One of the most original and engaging TV shows in recent memory, Quantum Leap: The Complete Third Season provides excitement, humor, or drama in every episode. The barebones DVD features sufficient audio and image transfers, so it's worth a purchase.